Whether you’re looking to serve the whole pie, or you’re selling by the slice, we sell pizza boxes wholesale for your establishment. Choose from corrugated boxes, cardboard boxes with clay coating, printed styles, and plain options. Our pizza boxes come in a range of sizes to hold your small, medium, or large pizza. 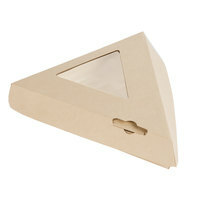 And for customers ordering a single serving of pizza, be sure to check out our pizza slice boxes. Also make sure to check out other great items from Choice, Solut, Bagcraft Papercon, GreenBox, LBP and Royal Paper. We offer pizza boxes at wholesale prices, which is perfect for stocking up in your pizzeria, ma and pa shop, or other restaurant. Be sure to deliver your customers’ orders in high-quality, reliable products. From a large pizza for a family to share to individual slices, we have a delivery option for any order. For more convenient pizza delivery and preparation supplies, be sure to also check out our pizza delivery bags, pizza / dough cutters, and wax paper for lining the bottom of your pizza boxes. If you're wondering where to buy bagcraft papercon pizza boxes and accessories, we have a large selection of bagcraft papercon pizza boxes and accessories for sale at the lowest prices.